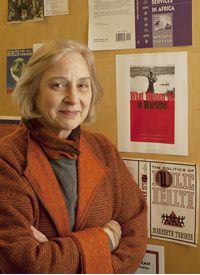 Meredeth Turshen is a Professor Emeritus in the Edward J. Bloustein School of Planning and Public Policy at Rutgers University. Her research interests include international health and she specializes in public health policy. She has written four books, The Political Ecology of Disease in Tanzania (1984), The Politics of Public Health (1989), andPrivatizing Health Services in Africa (1999), all published by Rutgers University Press, and Women’s Health Movements: A Global Force for Change (2007) published by Palgrave Macmillan; she has edited six other books, Women and Health in Africa (Africa World Press, 1991), Women’s Lives and Public Policy: The International Experience(Greenwood, 1993), What Women Do in Wartime: Gender and Conflict in Africa (Zed Books, 1998), which was translated into French (L’Harmattan, 2001), African Women’s Health (Africa World Press, 2000) , The Aftermath: Women in Postconflict Transformation (Zed Books, 2002), and African Women: A political economy (Palgrave Macmillan, 2010). She has served on the boards of the Association of Concerned Africa Scholars, the Committee for Health in Southern Africa, and the Review of African Political Economy, and is on the editorial board of the Journal of Public Health Policy. 2018: Schneider D and Turshen M. “Political and Social Violence: Health Effects”. In: Encyclopedia of Environmental Health, 2nd ed, J Nriagu, Ed. Oxford, U.K.: Elsevier. Updated throughout. from the 2014 edition.